Judging by his production of dirty diapers, Timothy’s digestive system seems to working just fine. We’ll get an official reading of his recovery when we visit his surgeon later this week. We also go back to his Ear Nose and Throat doctor this week, where they’ll check on his ear tubes and test his hearing. 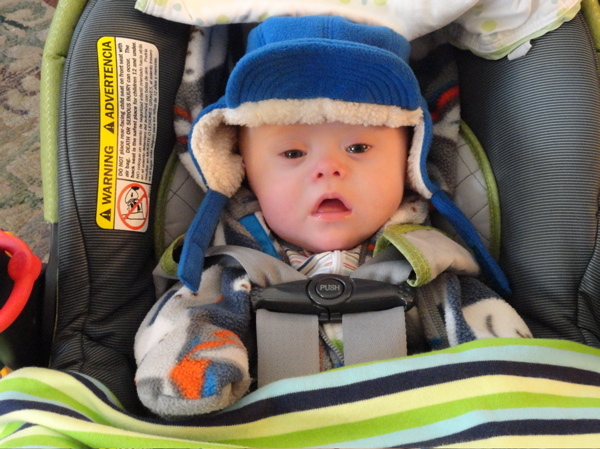 While it’s hard to say that Timothy’s hearing is much better as a result of his ear tubes, he seems a little more responsive now to sounds, and seems to wake up more easily, which might be partly related to his hearing. We worked hard to keep the little bobber healthy before his surgery, but it’s too long of a winter to avoid getting a little sick. No problem – he’s just picked up your garden variety baby cough and sniffles. This is probably what’s contributing to him recently waking up a few times during the night. The kid has always been a gold medal sleeper and we go to bed praying that he’ll get back on track again shortly. We’re so spoiled in this area. Timothy is a grabber – whether his wires in the hospital or the skin on your face, if it’s within arm’s reach, he’s grabbing at it. When he had his colostomy bag, Timothy was in the habit of reaching down with his left hand and pulling on his bag. Now that he has full use of the entire digestive highway system, he no longer has the bag, but the little habit remains. Every once in a while he’ll still sweep his left hand by his hip in what looks like he is either strumming a guitar or reaching for his car keys. Coming up empty handed, he remains cool, but has to be wondering when someone is going to remember to replace the bag. The little guy was probably missing his pal the bag, especially during those early diaper rash days. The good news is that the diaper rash has improved quite a bit. Maybe it was growing up with the TV show ‘Eight is Enough’, but Laura and I at least wondered early on about the idea of having a large family. But over time, things just worked out that two girls was a good number. Now, in a funny way, we’re getting a little taste of that large family experience. We may only have three kids, but now that we’re planning a baptism for Timothy and a confirmation for Elisabeth, have our teenagers helping out with the baby and have both some new energy and chaos injected into this middle aged household, it sometimes feels like we’re a large family that just never got around to having those middle kids. And right now, three is plenty.